Born in Churchbridge, Saskatchewan. Hal Sigurdson was with the Winnipeg Free Press for some 40 years and covered junior and senior hockey, the Western Hockey League and the World Hockey Association. He was the Sports Editor with the Free Press. 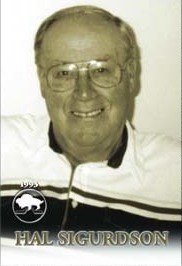 He wrote the popular series Down Memory Lane and served on the Selection Committe of the Manitoba Sports Hall of Fame. Hal Sigurdson was also named to the Manitoba Sportswriters and Sportscasters Association Media Roll of Honour.